I’ve written about and reviewed a number of iPad cases from Pad & Quill over recent years. They’re handcrafted cases that are always striking looking and exude quality. Recently the nice folks at P&Q have extended their line and now offer a series of leather bags that are just exquisite looking. Although these are not strictly iPad accessories – they’re more versatile carrier bags for a number of purposes – they can certainly accommodate a laptop, a trusty tablet, and quite a few other essentials. 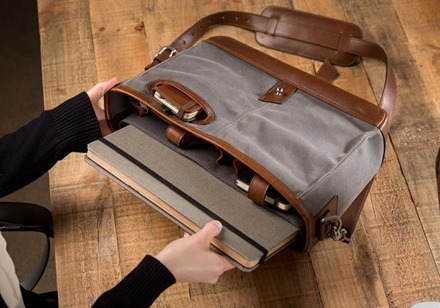 Too accomplished for a nylon bag, way too far from the grave to consider a briefcase, the Pad & Quill Messenger Bag is just the carrier you need. Crafted battleship tough-enough to become a family heirloom, the substantial full grain American cowhide leather and hefty twill woven waxed canvas will age, mar and inevitably record an ever evolving story of your daily travels – even if they are just to work and back. 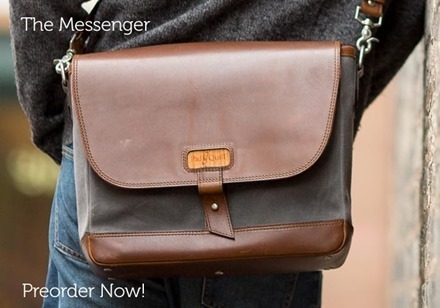 Amazing storage and amazing luxury meet in this refined Messenger bag. Hand made with the finest materials, including the same stitch thread used in parachutes…yes. Then adorned with a real cherry wood panel that has our mark laser etched in the center. Inside you’ll find a signature. That is the autograph of our brother or sister in Leon that made the bag your holding in your hands. Signature Pad & Quill bookmark accents! These are premium priced leather bags, but I have to say they look well worth the cost. You can see more detail at the Pad & Quill product pages for their new leather bags.